Edith Budge was born in 1833 in Crewkerne, the daughter of grocer John Budge and his wife Elizabeth. In the 1841 census Edith was living at home in East Street, Crewkerne with her parents, eight siblings and a servant. By the time of the 1851 census, John Budge had moved his family to Back Street, Crewkerne and Edith, now aged 17, was working as an assistant in his grocery shop. In the 1861 census 27 year old Edith was listed living in High Street as a draper's assistant (one of eight live-in assistants and apprentices) to Ann Ryall, a draper and the widow of Benjamin Ryall. By 1866 Edith was living in Yeovil and in November she was a witness to a pick-pocket robbery and gave evidence at the Borough Petty Sessions. In the 1871 census she was listed in Princes Street as being aged 34, unmarried and she gave her occupation as draper. Living with her was 27-year old Marian Hallett, also unmarried, and giving her occupation as milliner. There was also a resident domestic servant. From the position of the record within the census it would appear that Miss Budge ran her establishment in one of the Princes Street premises close to the corner with today's Westminster Street. 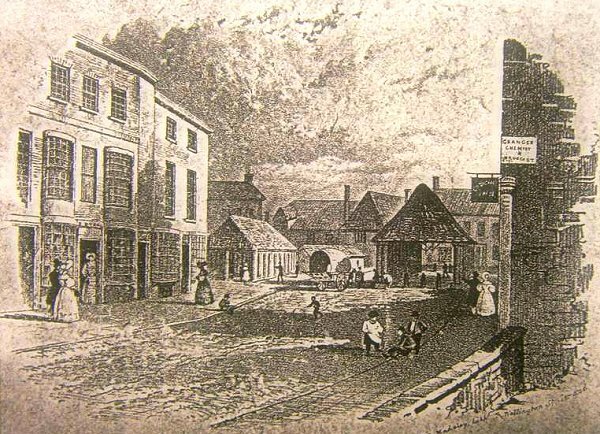 This sketch, made by GE Madeley to illustrate his map of Yeovil of 1831, shows the Borough seen from High Street - roughly the view seen today from the north end of King George Street. The Shambles is to the left and the Market House is to the right. The buildings at far left still stand today, that to the left is Clement White's shop, today's 8 High Street, at this time occupied by draper Benjamin Ryall whose name appears above the door. By 1861 Edith Budge was living here as an assistant to Ryall's widow Ann who had taken over the drapery after the death of Benjamin Ryall in 1856. 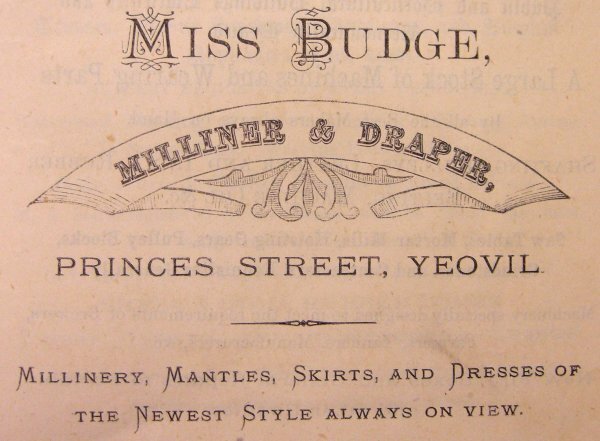 Miss Budge's advertisement in the 1878 edition of Whitby's Yeovil Almanack Advertiser.